The basic double room for two guests. 30 sq meters. This is a lovely room and bathroom with a porch facing the Jerusalem mountains. Approximately 60 Sq Meters, 2 LCD screens, + large balcony. There are 2 suites in the hotel. Equivalent to a small apartment with a kitchenette and a separate dining room. Approximately 90 Sq Meters + large balcony, king size bed. There is 1 Deluxe suite in the hotel. Cramim Spa Resort is a delightful luxury get-away in the center of the country. While Cramim is just minutes from Jerusalem, the luxurious and relaxing atmosphere seem miles away. Cramim is named for the vineyards that characterize this part of Israel. These lands are the Israeli Napa Valley of yore, rich in vineyards and wineries. Cramim Resort captures that spirit in its fine and elegant ambiance. 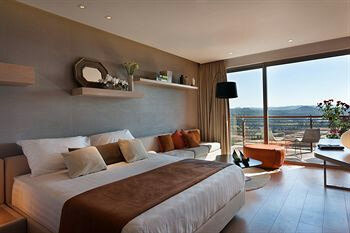 Your room at Cramim overlooks the beautiful hills of Jerusalem. Relax on your private patio, enjoy the health and sport facilities, massages, and treatments. Lean in and refresh your soul. 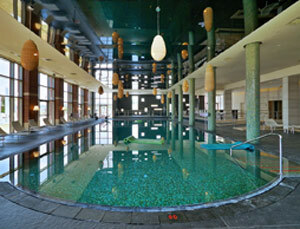 Cramim is a kosher spa resort under the hashgacha of the Rabbanut. Complete the reservations form and eLuna will advise you on the specials on your dates. NIS 480 for 2 treatments (value NIS 750) per room. NIS 420 for 2 treatments (value NIS 750) per room. 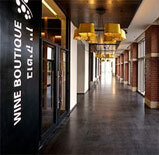 NIS 360 for 2 treatments (value NIS 750) per room. Two guests in a Cramim Room with Mountain View, bed and breakfast (BB) Add NIS 225 per person for dinner when you book through eLuna. The hotel reserves the right to change these offers without prior notice. Your credit card will not be charged till you arrive at the resort. The Cramim Spa Resort is your vacation destination, any way that you like to vacation . If you just like to relax and hang out, you have come to the right place. Pull up a chair on your private porch and take in the view. Hang out on a lounge chair at the pool and mosey around the resort. Folks who like active sporty vacations will enjoy the pools. The gorgeous new half Olympic size indoor pool is open year round. There is also a lovely smaller outdoor pool and a snack bar for nibbles and drinks. As you approach the pool you will pass the fitness room with exercise machines. Along the hallway pass light and airy rooms with exercise classes in session. Sign up for any of a selection of classes. If massages and treatments are your thing, enjoy some of the dozens of health and beauty spa treatments available. The resort recommends that you book your treatments about a week in advance of your visit. Submitted by: michael spiro. Date: May 2016. Comment: My wife and I have travelled extensively over the years, staying at many hotels. Cramim is the absolutely most beautiful hotel at which we have ever stayed. Everything was top-notch- the room, the food, the service. We can hardly wait to go back. Submitted by: SavtaBarbara. Date: May 2016. Comment: Had a wonderful time. This spa is beautiful, great rooms, fantastic service, this is 3rd time there in the last 1 1/2 years! Worth every cent, plus. I love it, and the location so close to the middle of Jerusalem can't be better! Ideal get a way resort! Submitted by: Peter S., London. Date: May 2016. 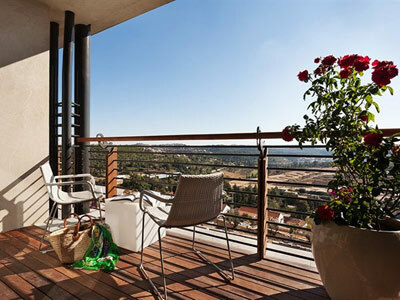 Comment: A recent addition to the Isrotel stable of great Israeli hotels – comfortable and stylish rooms, a great swimming pool, tranquillity and fantastic food. If you have been to the Carmel Forrest Spa but need something closer to Jerusalem, look no further. If you haven’t been to the Carmel Forrest Spa, go to both! Submitted by: Shoshana Date: 24 March 2016. Comment: Our day at Cramim was terrific. The hotel is beautiful, the staff was lovely, the food was outrageously delicious and my massage was heavenly. Thank you again for your help. Submitted by:Bob Margulies Date: 25 February 2016. Comment: we had a fantastic time at the Cramim Spa. We have previously been to the Carmel [Forest] and Beresheet Spa, so they are all very nice, but different as well. We really enjoyed our stay. The food was good (very israeli- the Carmel spa was more "american type" and we think the Beresheet was also perhaps more attuned to the Anglo crowd), but the crowd when we were there was mostly israeli, so no bid deal. but the food was good, the spa and treatements were great; the exercise and fitness classes were great; the little wine area was cute and nice; the room was good and the pillows also good!] So, thanks for helping out.! Submitted by: Avraham & Yaffa G Date: 1 Feb 2016. Comment: We enjoyed being at the Hotel. We especially enjoyed the quiet atmosphere during the meals which were plentiful and tasty. All the employees were helpful for any questions we asked. Our visit was short, one day only and left us with a taste for more. Submitted by: ejloewe@aol.com. Date: 15 Oct 2015. Comment: Just want to let you know that we had a wonderful time at the Cramim Hotel. The staff really goes out of their way to see that their guests are comfortable and happy. The Spa was very nice and my massage was heavenly. The whole experience was lovely and we look forward to the time we can go again. Dining: Your reservation includes a generous buffet dairy breakfast with both cold salads and hot dishes. A full meat buffet dinner is served every day for an additional fee. There are two seatings: early eaters and those who prefer to eat later. Reserve your seating when you check in. Lunch is available for an extra charge at the lounge bar which offers light milk meals such as salads, and when open at the Pool Bar which offers meat options. Book a half board stay and enjoy the discount that you receive on the room rate, on the dinner as well. Kashrut: Cramim hotel is under the hashgacha of Rabbanut Mateh Yehuda, Rav Avraham Charlap. There are two full-time mashgichim weekdays and one on Shabbat. Food products have the Rabbanut hashgacha. Leafy vegetables are Gush Katif. See the mashgiach kashrut for details. Ask for Eliezer. Wine bar In-room mini bar and coffee/tea corner. Gift Shop selling exclusive Cramim, Carmel Forest, and Beresheet clothing, cosmetics, aromatic oils and more. Activities include workshops, guided walks, yoga, meditation, tai-chi, aerobics, spinning, body conditioning and more. Cramim also has one 2-room suites. This must be reserved well in advance. The hotel does not accommodate children under the age of 10. Children over aged 10 with parents must have their own room. Up to two children over aged 10 in one room. Treatment List and Treatment Reservation Form, view a map showing how to get to the resort. Meals: A generous dairy buffet breakfast is included in the room rate. 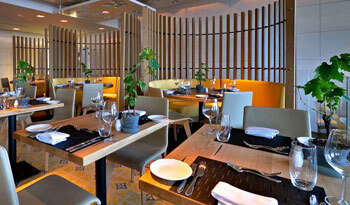 An elaborate buffet dinner is available for an extra NIS 250 per person. Book dinner with your reservation or at the hotel. 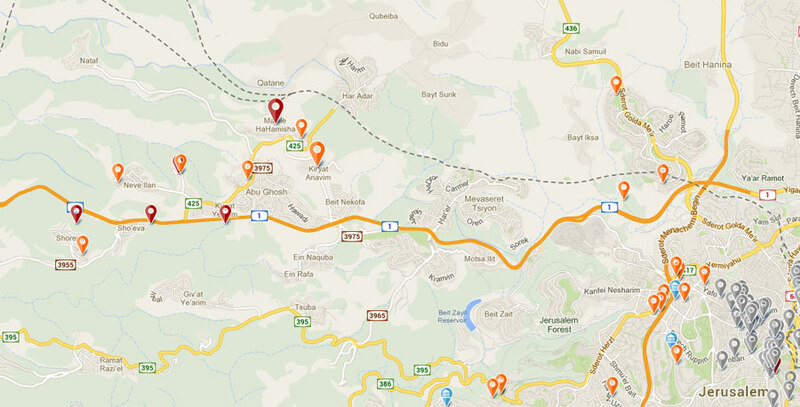 location: Cramim is located in the western hills of Jerusalem. It is about 15 minutes from the entrance to Jerusalem on Highway 1, the Jerusalem Tel Aviv highway. Exit the highway at the signs for Kibbutz Kiryat Anavim and Maaleh Hahamisha. Then follow the signs to Cramim. Parking is in front of the hotel. There is valet service from your car to the hotel. Complete the reservations form and eLuna will advise you on the rates on your dates. Rates quoted are per room in Israeli Shekels. Tourists presenting proof of status will save the VAT (tax). Rates will be reduced at the hotel. * Rates are for Bed & Breakfast. There is an additional fee of NIS 250 per person for dinner. Order dinners (half board) with your reservation and pay only 225 shekels per person instead of 250 - a savings of 25 shekels per person. In addition to this discount, you will also receive the discount that you get on your room rate on your dinner. * Rates apply to Israelis and tourists. * Tourists presenting their foreign passport will save the VAT (tax). The rates quoted will be reduced at the hotel. Dinner nis 225 per person when booked with your reservation. The rates include: Unlimited use of all facilities (excluding treatments): fully equipped fitness gymnasium, exercise and relaxation classes, two swimming pools (one covered and heated), Jacuzzi, dry and wet saunas, Turkish Hammam, relaxation terrace-solarium. Various activities free of charge: Yoga, Tai Chi, lectures, and more. There is no penalty if a cancellation request is received up to 14 days before your vacation. If the request is received up to 7 days before your vacation a cancellation fee of 25% of the reservation will be charged. If the request is received less than 7 days before your vacation a cancellation fee of 50% of the reservation will be charged. A no-show or cancellation on day of arrival will be charged in full. Cancelling Holiday Reservations: Free cancellation up to 21 days before holiday (chagim) reservations. If the request is received 20 days up to 7 days before your vacation a cancellation fee of 25% of the reservation will be charged. 50% fee from 6 days prior to date of arrival. A no-show or cancellation on day of arrival will be charged in full. Cancellation must be requested through eLuna. Treatments must be cancelled separately via the Spa. Mid-week specials apply only Sunday - Wednesday night, based on availability, not including holidays.